Home Business How much will cost the Construction of Sarajevo – Belgrade Road? How much will cost the Construction of Sarajevo – Belgrade Road? Bilateral meeting between Minister Ismir Jusko with the Minister of Transport, Naval Architecture and Communications of Turkey Ahmet Arslan took place in the premises of the Ministry of Communications and Transport of BiH as part of the visit of the High Delegation of the Republic of Turkey to BiH. 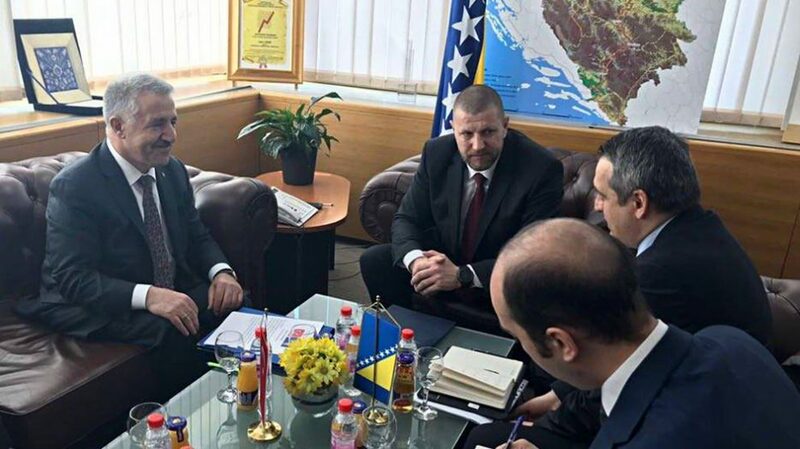 Besides other topics, they also discussed the activities that the Turkish side is currently implementing on the project of the construction of a modern road between Sarajevo and Belgrade. Minister Arslan informed all the attendees that the current analysis shows all the complexity of the project, and he especially noted the terrain through which this road needs to pass. Therefore, it was established that it is necessary to build around 133 bridges with the total length of 25.8 kilometers as well as 53 tunnels with the total length of 37.5 kilometers on the section of the highway that goes through BiH, from Sarajevo to Tuzla to the border with Serbia and from Sarajevo to Visegrad to the border with Serbia. Turkish minister also added that lengths of the sections and accompanying objects on sections that are going through BiH have been established, as well as the preliminary estimate of the value of the project, which will amount to about 3 billion EUR. The financial structure of the project, i.e. the manner and the models of financing, should be announced by the month of June this year. The Turkish delegation also emphasized the development of air traffic, and the improvement of the existing agreement between BiH and Turkey in the upcoming period was proposed with the aim of further development. Moreover, Minister Jusko requested from the Turkish side to invest additional efforts on signing the Agreement on the recognition of driving licenses between these two countries soon, for which he received the confirmation from Minister Arslan.